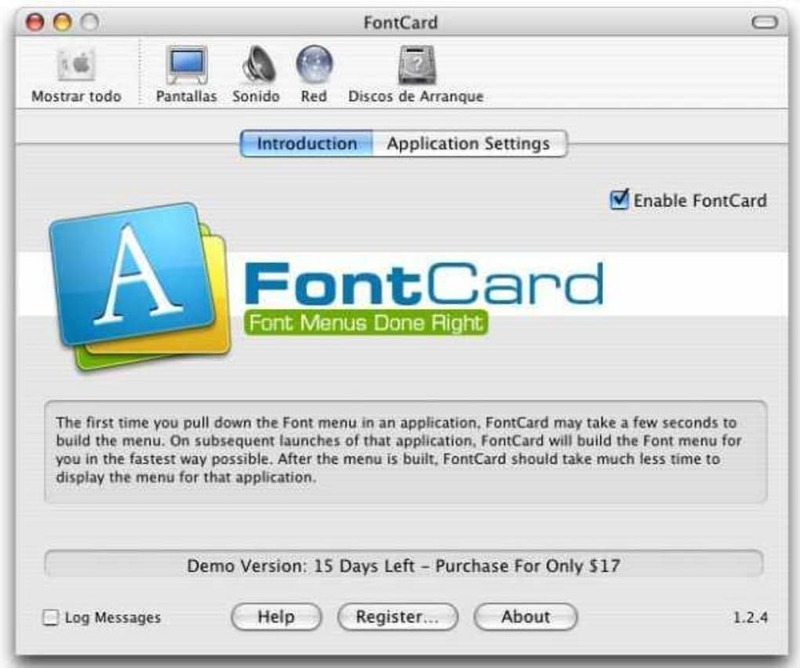 FontCard is a popular, trial version Mac software, that is part of the category Customize your Mac with subcategory Fonts. 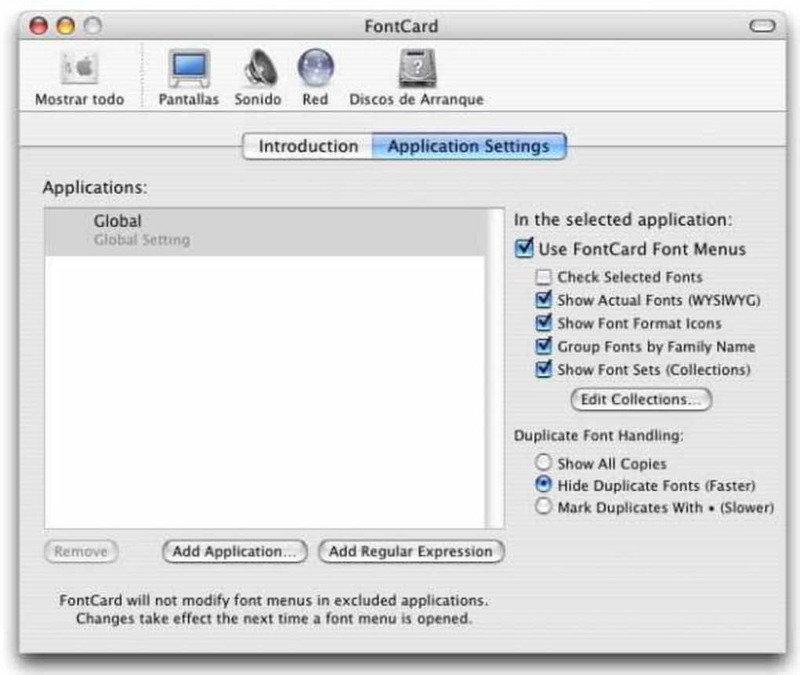 FontCard is available for users with the operating system Mac OS X and prior versions, and it is only available in English. The software version is 1.3.2 and was updated on 2/08/2006. About the download, FontCard is a program that takes up less free space than most programs in the category Customize your Mac. Since we added this program to our catalog in 2006, it has obtained 649 downloads, and last week it achieved 0 downloads. Fixed a combinatorial speed hit when opening or scrolling a font menu with inactive fonts in it. Fixed a crash when opening a popup menu if FontCard was not ready for a menu to open yet. Fixed a problem that prevented inactive font previews from working if the name of the home folder differed in case (Bob vs. bob) from the name specified in NetInfo. Addressed an issue that would cause the FontCard menu to appear in places it shouldn't, especially in the various palette menus of Adobe Illustrator CS. Fixed a problem that would cause the All Fonts group to be replaced by the first font alphabetically if the first font also had a duplicate installed. Fixed a delay that could occur when opening menus if calculating the contents of their submenus was compute intensive. FontCard should now list FontAgent Pro sets that only contain other sets and do not contain any fonts themselves. Addressed a problem that caused some incomplete font items in a FontAgent Pro sets to slow down inactive font displays. The mark duplicate fonts option works again. Fonts are now sorted in all font sets except for Recents and Favorites, which are sorted by use. Fixed a problem in which the FontCard menu would be appended to the end of the font menu in some Cocoa applications. Increase compatibility with Macromedia Fireworks. Added support for Photoshop Elements (it is treated in the same manner as the regular Photoshop). Improved support for applications that insist on supporting bitmap only fonts (like Aachen) even though Mac OS X has very poor support for bitmap fonts. The Crash Catcher works correctly again and now catches crashes caused by corrupted name entries in a font. Addressed a problem in QuarkXPress that would cause the font menu in the Usage dialog to be disabled if the font menu in the menu bar had been opened beforehand. FontCard is a haxie that modifies the Font menu in Carbon and Cocoa applications. It can add an icon that displays the format of a font next to the font menu item, display the font name in the font face, group fonts into submenus, and add font collections to the font menu. Last but not least, it gives you the power of a professional font management utility. What do you think about FontCard? Do you recommend it? Why?